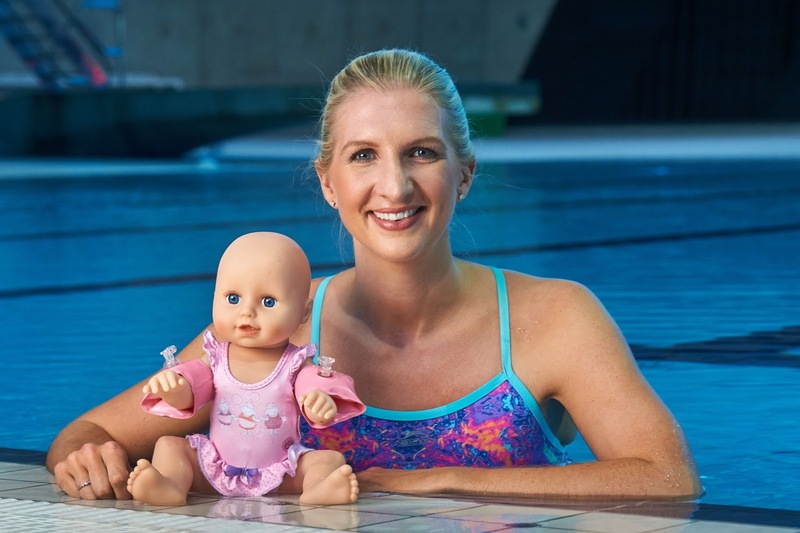 Baby Annabell - the UK's number one selling large doll brand has teamed up with Olympic swimmer Rebecca Adlington to celebrate the launch of their brand new Baby Annabell Learns to Swim doll. 1 - Children can be initially nervous of the water, baby steps and lots of praise will help them overcome a lack of confidence. Try taking them alone to just watch for the first time, then toes in next time and so on, along with lots of positive praise to help encourage them to take that first dip. 2 -Toys are a brilliant tool, they are such a good distraction for anyone who doesn’t normally like putting their face in the water or splashing. Toys such as the new Baby Annabell Learns to Swim doll are a great way to give children (and parents!) the courage to take those first steps towards swimming. 3 - Swimming is huge bonding experience. The learning process is a lot to do with trust and really builds a closer relationship between and parent and child. For this reason, try not to use your phone during lessons to avoid distractions. 4 - The younger you start swimming lessons the better. I took Summer from 3 weeks old. It is all about building confidence and awareness of the water from a young age. Swimming also helps with a child’s muscular development and is fantastic for understanding their physical abilities. 5 - Make good use of the equipment that’s there. Whether it’s armbands, noodles, or vests, use whatever your child is more comfortable with. I tend to do five minutes with floatation equipment and five without, this helps when they’re really young and still building confidence. 6 - Mix up who takes the child swimming. Whether its Mum, Dad, Grandparents etc. It’s good to go with someone they trust whilst getting used to swimming with different people. Suitable for ages 3+, Baby Annabell Learns to Swim Doll is available from all good toy shops and Amazon now (click here to buy - affiliate). I am delighted that Zapf Creation has provided us with one Baby Annabell Learns to Swim Doll to Giveaway to one lucky reader. To enter, simply use the rafflecopter below. There are 9 ways you can enter - you can do them all to increase your chances or just one, it's up to you. Daily entry is available via Twitter. UK entries only. Prize can be posted to any UK address. Prize is non-transferable and no refunds or alternatives are available. Winner will be selected at random from all valid entries within 7 days of the giveaway ending and contacted via Email. Employees and family of Zapf Creation and North East Family Fun are excluded from entry. Keep at it, never give up! Make it fun and perhaps let your little ones choose which swimming costume, colour of goggles they would like, try and get them involved. Most of all make it enjoyable for them. I really wish I had taken the kids when they were smaller. Start early! Introduce your baby to water as soon as they are well enough to avoid fear later on. I took all my four babies to our local pool from the age of 6 weeks to get them used to the water! I don't have any kids and can't swim very well myself. It would certainly be beneficial for kids to start swimming at a young age. Swimming lessons from an early age always helped mine! Start them when they are babies turn into a game take toys and have fun! I was praising a lot when we my daughter started her swimming lessons. before she joined to a class we took her to the local pool couple of times a week and played pool games and she wanted to get lessons. The best way to get your child familiar with the water is to start in the bathtub or kiddie pool once he or she can confidently sit up on their own (typically around 6 months). Having this experience in a calm, happy place will help your child stay relaxed in the more chaotic environment of a public pool or beach. To start as early as possible. To be honest I am not a confident swimmer myself so my husband teaches our children. My tip is to let the strongest swimmer teach your children! Take the children to local swimming pool at a young age (baby), accompanied by competent swimmer/s. Introduce little one to the water (swimming pool) gradually ( at baby's pace). Make sure you all behave safely, there should also be life guards at the pool. Allow little one to have fun in the pool with use of floats etc ( suitable for age and ability of baby/ child). Book a session of swimming lessons when appropriate ( discuss with life guards / staff at local swimming pool). Flotation vests can be good for youngsters. Allow little ones to build up confidence and skills in the swimming pool whilst accompanied by competent swimmer / responsible adult. Start off with a nice heated pool, there's nothing less enjoyable for kids than a cold pool! My niece is coming along nicely. I think having family and friends in the pool helps. Don't take your child out of their comfort zone, let them have fun in the water until they build up their confidence! My top tips are to not over face them, or push too far too quickly - and if they're a bit older splashing around in the shallows where they can comfortably stand is a great place to start! Keep it as fun as you can but safety first! I would start early to give them the confidence in water. Maybe start with some classes with other children of the same age. Its all about the confidence, make it fun and instill as much confidence with lots of praise and cuddles! Take siblings for support! Reward and encourage them.. giving them a confidence boost! Take them often and look into swimming classes. Start from a very early age . So that they get a feel for the water. My 2 and half year old twin granddaughter are learning to swim at the moment! I go with their mum a couple of times a week to our local pool, and they are progressing well!! My tips are ... 1) Show confidence 2) make learning fun 3) Get them used to putting their heads underwater first 4) use arm bands fully inflated when first learning, gradually deflating them as the child gets more confident 5)Let them do things at their own pace, being patient with them! Start them early at a young age - the earlier they feel comfortable in the water the better it will be. Start swimming lessons at 6 months, the perfect age to learn to swim. We used to play games in the pool to get used to the water to start with rather than learning to swim at the beginning. I would stay start as early as possible to get them used to water and make learning fun! To start as early as possible. Also, let them have lots of water play in the bath, as full as they are comfortable and let them splash, and pour water over themselves and head with encouragement. I am just starting my baby daughter with swimming, we have introduced our niece who came to live with us two years ago and she loves it, I think making it fun helps. It's really important to introduce children to swimming as early as possible and it's really important to make it fun. One of the best ways is to introduce them to water and swimming through a paddling pool so they get used to getting water in their eyes and on their face.